As the economy grows and technology develops, the career landscape shifts in response. According to the U.S. Department of Labor Bureau of Labor Statistics (BLS), certain jobs are expected to grow in the coming years. The fields with anticipated growth include home health care, energy, education, mathematics, and more. A survey from CareerBuilder reports that high-wage (5.71 percent) and low-wage (5.69 percent) jobs will have the most job growth between 2018 and 2023. Middle-wage employment is expected to grow at a much lower rate - 3.83 percent. The survey defined low-wage jobs as those that pay $14.17 or less per hour, middle-wage jobs as $14.18-$23.59 per hour, and high-wage jobs as $23.60 or more per hour. Solar Photovoltaic Installer: Solar photovoltaic (PV) installers assemble, install, and maintain all kinds of solar panel systems. Many of these systems are on rooftops or other structures. 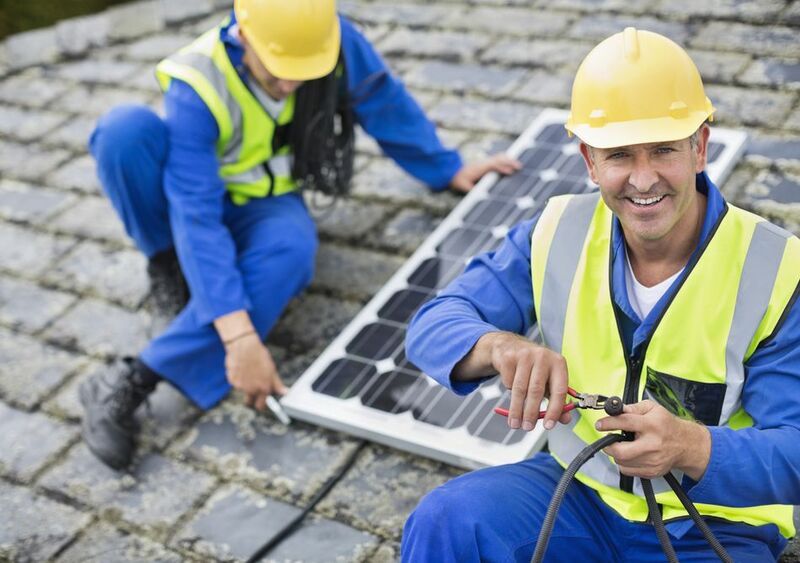 As solar energy becomes more and more common, there will be more and more PV installer jobs. PV installers need to understand complex electrical and mechanical equipment. They also need to be comfortable being on their feet – and outside – most of the day. To become a PV installer, you typically need at least a high school diploma. Many community colleges and trade schools have courses on PV design and installation. PV installers also receive training on the job. If you are interested in solar energy and have a knack for mechanical skills, this could be the job for you. Wind Turbine Service Technician: Like PV installer jobs, wind turbine technician jobs will also increase as people turn to alternate sources of energy – in this case, wind. Also known as windtechs, wind turbine service technicians assemble, install, maintain, and repair wind turbines. Wind turbine techs have to be comfortable working in confined spaces (wind turbines) and at tall heights. They generally learn their trade through community college courses or trade schools, many of which have certificates and associate’s degrees in wind energy technology. Home Health and Personal Care Aide: Home health and personal care aides provide assistance to elderly adults or disabled or ill people who require help in their day-to-day lives. Aides help with eating, bathing and dressing, and may also be responsible for giving medication or checking vital signs. Home health and personal care aides generally work in a client's home, but are sometimes employed in group homes or assisted living facilities. Most home health and personal care aides must pass an evaluation or receive a certification to work, depending on the state they live in. Some states require more formal training, in the form of classes at vocational schools, community colleges, or other similar programs. Physician Assistant: A physician assistant (PA) conducts physical exams, diagnoses and treats illnesses, and performs a number of other duties under the supervision of a doctor. While a PA does not have to go to medical school or complete a residency (like most doctors), he or she does have to complete a master’s program, which typically lasts two years. He or she must be certified before practicing. Statistician and Mathematician: Mathematicians and statisticians analyze data and perform various mathematical functions to address real-word problems. For example, they might design surveys or opinion polls to collect data, or analyze data from a poll to help a company improve its business. Many mathematicians and statisticians work for the government, while others work in research institutions. Most, but not all, have at least a master’s degree in mathematics or statistics. Some, however (especially statisticians), have only a bachelor’s degree, especially for entry-level jobs. Nurse Practitioner: A nurse practitioner (NP) cares for patients, although his or her duties vary state to state. Generally, an NP examines, diagnoses, and treats patients. Nurse practitioners must earn a master’s degree, and typically must have a registered nursing license, depending on the state in which they work. There are other kinds of nursing jobs that require a master’s degree, including nurse anesthetists and nurse midwives. These jobs are growing fast in part because of the need for healthcare services for the aging population. Physical Therapist Assistant and Aide: Physical therapist assistants (PTAs) and aides work with physical therapists. Assistants observe patients, help patients perform exercises, and might even help treat patients. For example, they might massage a patient or help the patient stretch. Aides do slightly different tasks. They might set up equipment and provide physical support for patients who struggle to walk. They also typically help clean up or organize the physical therapy room. Aides typically make less money than assistants. Most physical therapist assistants have a 2-year associate's degree from a physical therapy program, and many receive continued on-the-job training as well. Physical therapist aides generally need only a high school diploma and on-the-job training. Bicycle Repairer: More and more commuters are choosing to travel by bicycle. People therefore need more bicycle repairers than ever. A bike repairer typically works in a bike shop, fixing and maintaining bikes, and often selling related bicycle gear to customers. A bike repairer generally needs a high school diploma or equivalent, and must be comfortable with mechanical work. Bike repairers typically receive on-the-job training. Medical Assistant: Medical assistants perform a variety of administrative and clinical duties. They might perform clinical tasks such as recording patient history, measuring vital signs, and helping doctors with patient exams. They might also perform administrative work like scheduling appointments and entering patient information into an electronic database. They typically work in doctor’s offices, but they also might work in hospitals and outpatient care centers. Some medical assistants have only a high school diploma, and then complete on-the-job training. Others take certificate programs in medical assisting at vocational schools and community colleges. There are many other jobs in technology, healthcare, and energy that are on the rise. Below is a list of some of these other fast-growing jobs. Next to each job title is the expected percent change in employment from 2016-2026.